Cellular technology has become widely adopted by the automotive industry and is considered an important block in the automotive telematics control unit. Providing seamless and reliable mobile service (voice and data) is essential to ensure a good user experience. The proper behavior of the communication protocol as deployed by various mobile network operators and the outstanding performance of the device even under poor radio conditions such as fading need to be thoroughly verified before the product launch. Sometimes it is even necessary to conduct benchmarking tests to ensure your product leads the market. Field tests play a very important role in this context. Field tests enable users to test the module in real network environments, providing the required level of confidence for the functionality and reliability of the cellular module. Issues seen during field tests are usually hard to reproduce due to the dynamic nature of real world conditions, making it hard to verify the fixes. R&S®CMWcards is a graphic test script creation tool that runs on the R&S®CMW500, and requires no prior programming knowledge. Just by setting up a hand of cards, various signaling test scripts can be created to simulate a variety of test scenarios and verify your device’s protocol behavior. Each card comprises a predefined protocol procedure, yet provides the flexibility to allow the user to adjust the signaling parameters. The built-in error checking functionality of each card ensures the conformity of the signaling flows. 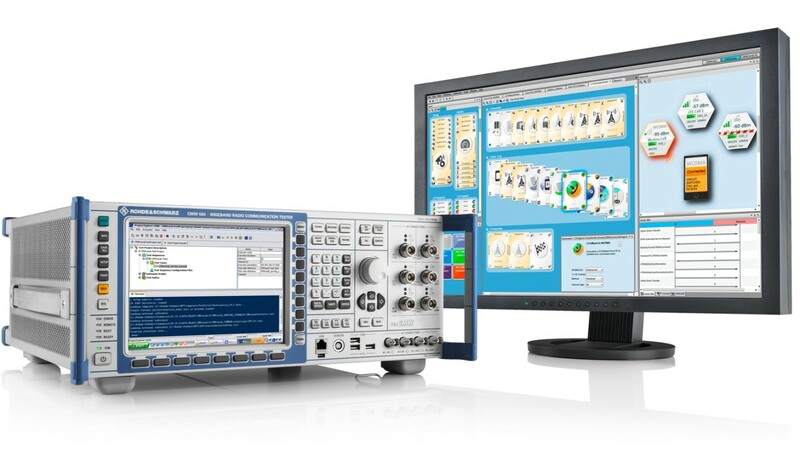 The field-to-lab (F2L) application works closely with R&S®CMWcards and allows the user to reproduce the real network scenario in the lab. The majority of field related issues can then be investigated in a controllable, repeatable and deterministic way. R&S®CMWcards with F2L is a powerful tool for verifying field behavior. 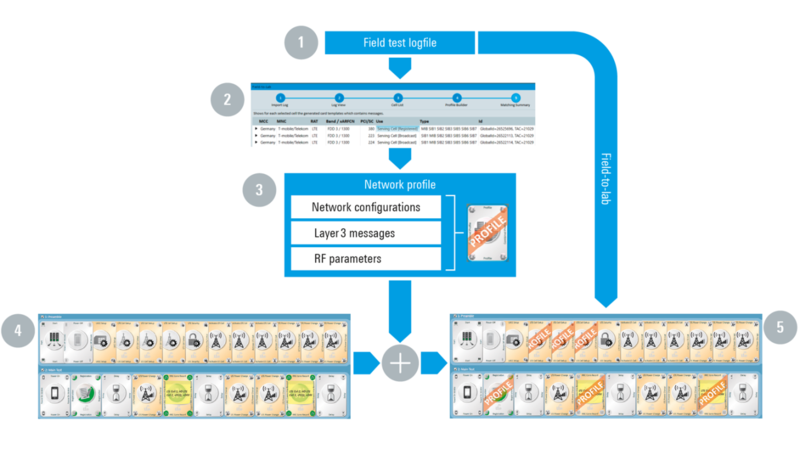 It extracts the network configurations from the field logs and imports them into R&S®CMWcards to simulate the test scenario with live network configurations, including cell information, RRC and NAS messages. It can replace particular layer 3 (L3) messages in the test script with the one from the field log in order to easily test the impact of this L3 message content on module behavior. Field RF conditions, e.g. RF power and quality, can also be extracted with optional synchronization with downlink messages and reproduced in the test script. In the future, it will be possible to extend the variable radio condition to simulate the fading condition. The figure below shows a typical use case of the R&S®CMWcards F2L feature. 1. To debug a field test problem, first a field test log file is needed. This kind of log file can be obtained by a Rohde & Schwarz network scanner or captured via the UE traces. 2. Feed the field log as input to the F2L application wizard. The wizard automatically analyzes the log file. Based on the analysis output, the user determines the network parameters and the L3 message contents that need to be further investigated. 3. The F2L wizard generates a network profile that contains the network configurations, layer 3 messages and RF parameters extracted from the field log. The network profile is a set of cards where the parameters of each card are configured like those in the real network. 4. Create an R&S®CMWcards test script that reflects the test sequence of your field test. 5. Select the network profile created in step 3. The network profile will automatically replace the cards in the test script you created in step 4. 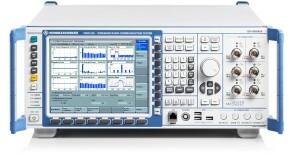 After step 5, the R&S®CMWcards test scenario simulates the live network conditions in a lab environment (R&S®CMW500). 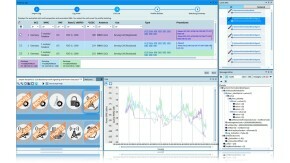 The R&S®CMWcards and F2L combination offers a unique and powerful way to recreate and eventually resolve automotive field test problems in the lab. This approach greatly increases debugging efficiency, optimizing your OPEX.